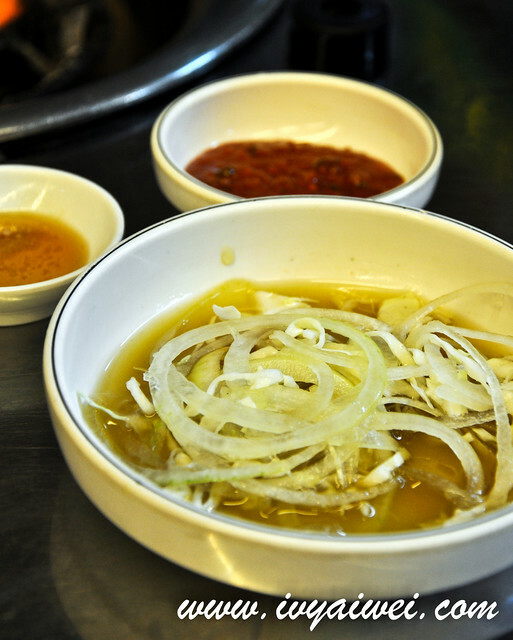 Aside from steamboat like Steamboat Letien and Bone & Pot, what is great after the rain??? 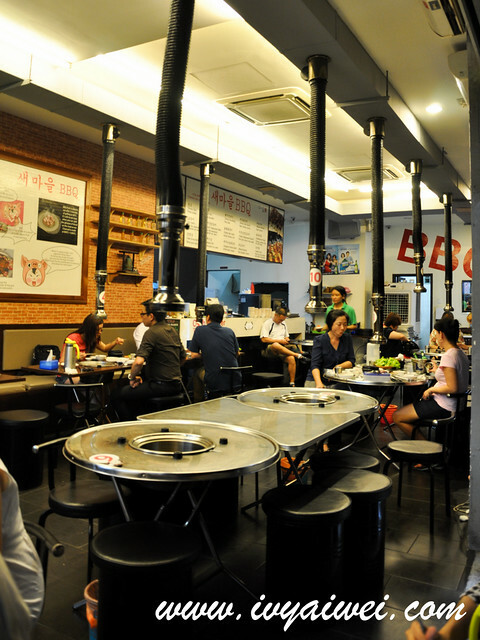 Call for Korean BBQ!!! Last few days, when my bff was in KL for a short holiday, I had her over for dinner on a last minute call. We both agreed to have a warm and good BBQ session after the downpour and we came to this restaurant. 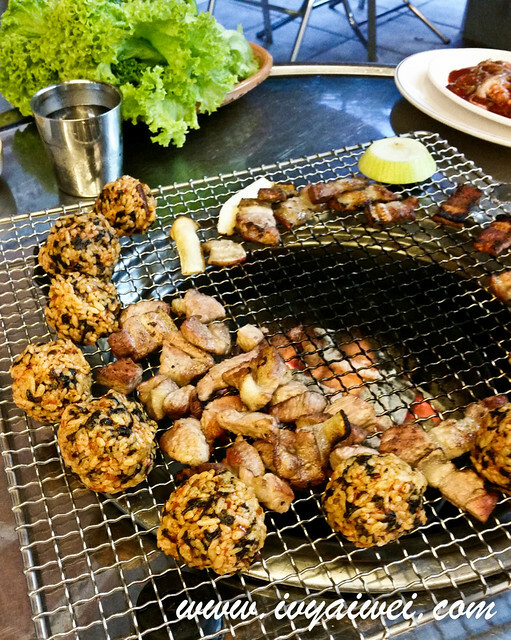 Located at one corner in Solaris Mont Kiara area, Sae Ma Eul BBQ is a no frill Korean restaurant, serving Korean BBQ over the charcoal fire as well as non BBQ dishes such as hot stews, noodles dishes, pajeon, and they have a very lovely lunch box which is priced affordably. 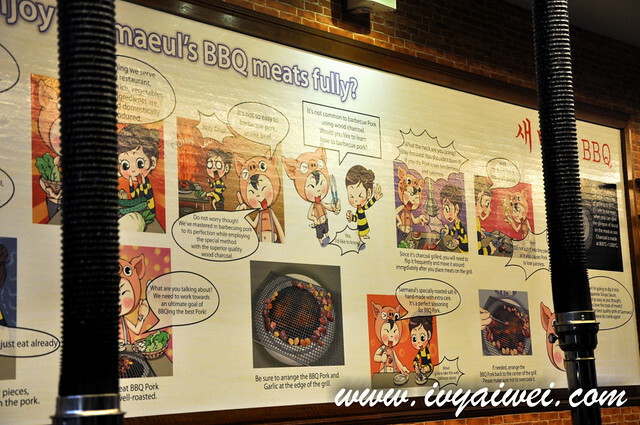 Spare some times to read the board with cute characters on the wall in order to enjoy the BBQ meats at a maximum syok-ness. Onions and the dipping(s) for the BBQ meat. 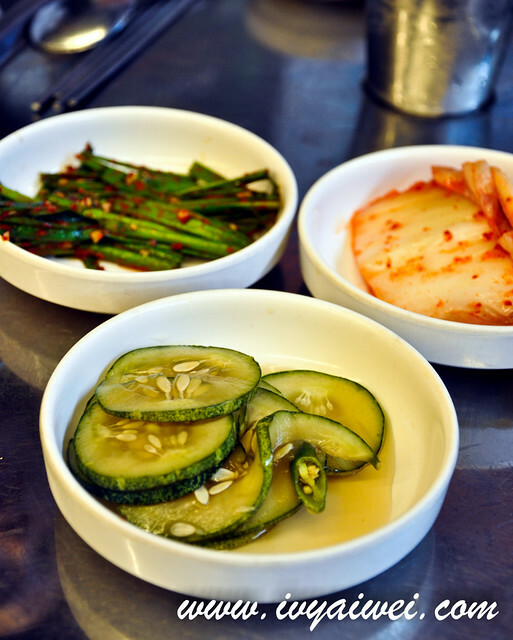 Kimchi, pickled cucumbers and chives were all so yummy. 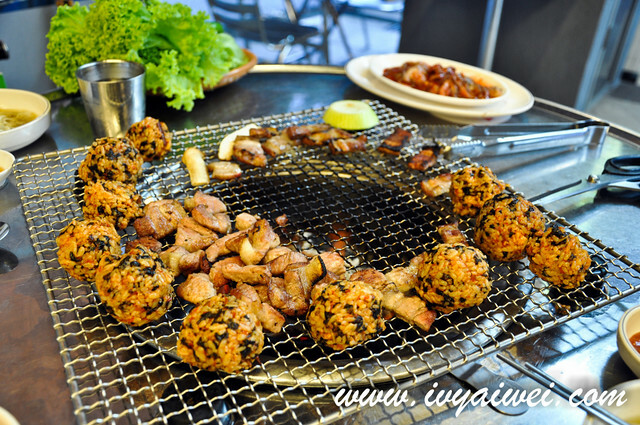 We ordered a BBQ Set that is catered for 2 – 3 pax (Rm 55) came with Sliced Pork Belly, Pork Shoulder and Grilled Baby Octopus (Juggumi Sutbul Galbi) and Choirutan Jumoekbab (Rm 20), the Spicy Rice Ball. 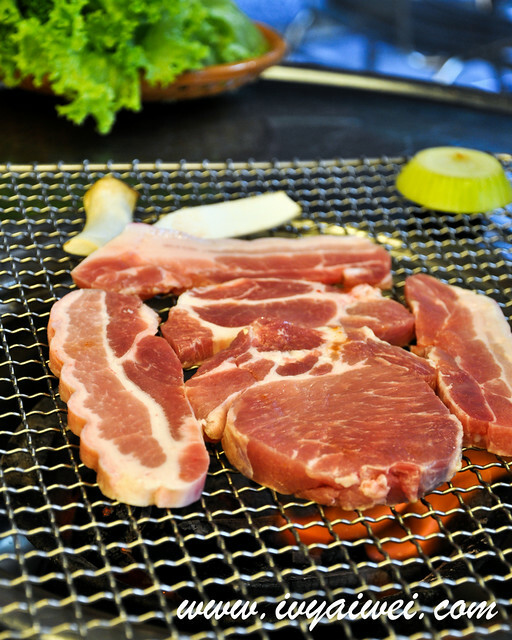 The pork slices were fresh and appeared pink. 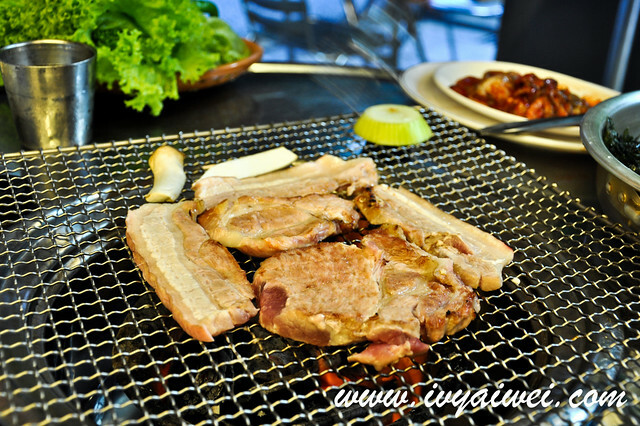 The staff will help you to grill them into perfection and cut them into small for you to enjoy them slowly. 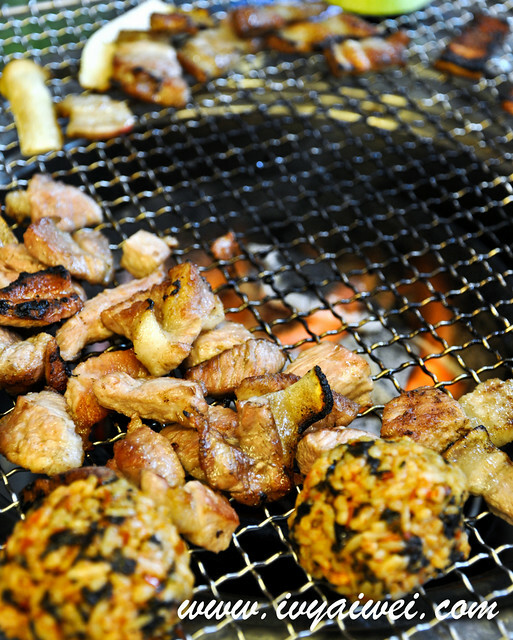 After a while, the staff will return to grill the baby octopus. 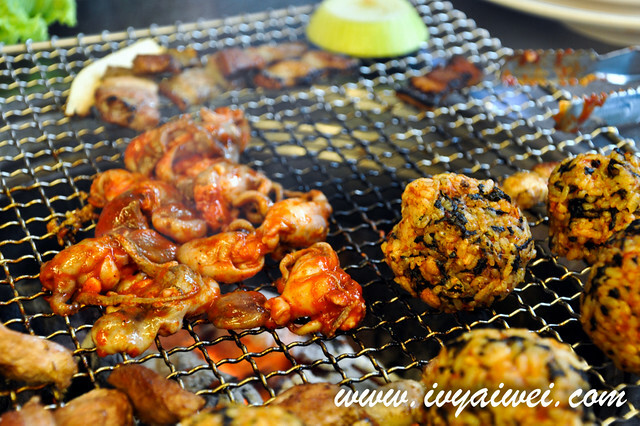 Grilled baby octopus is a must to order. Am glad that it is part of the set menu as there was only the 2 of us, we really couldn’t finish them all with another additional orders. 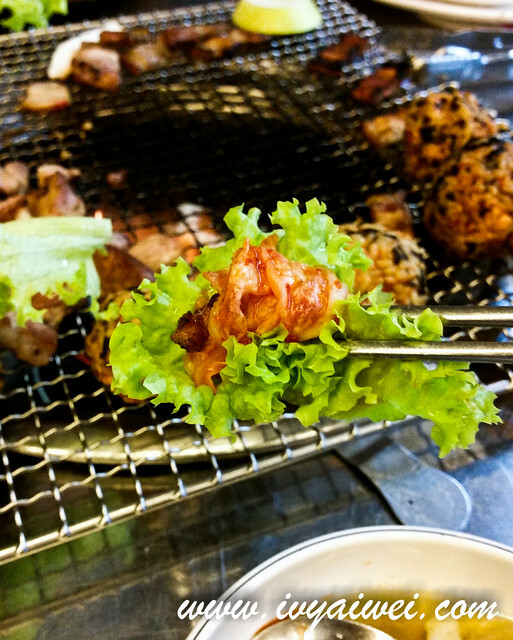 The grilled baby octopus was very well marinated and it was super fragrant and bouncy after grilling over the charcoal fire. 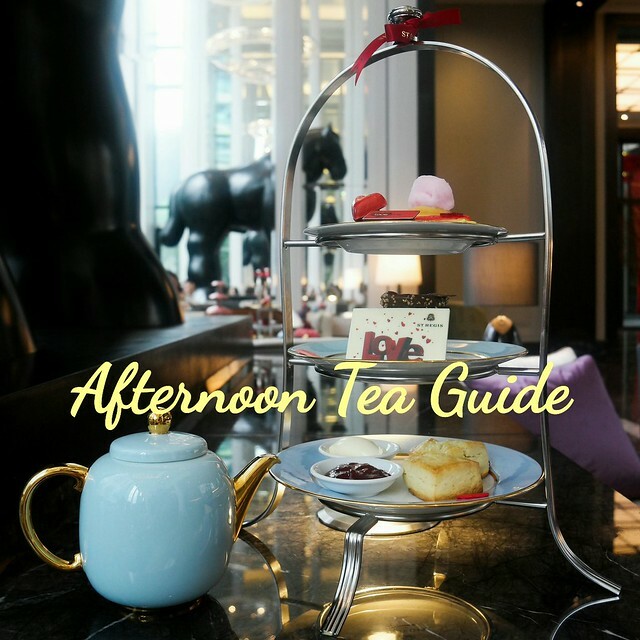 Must must must order, I assure you. 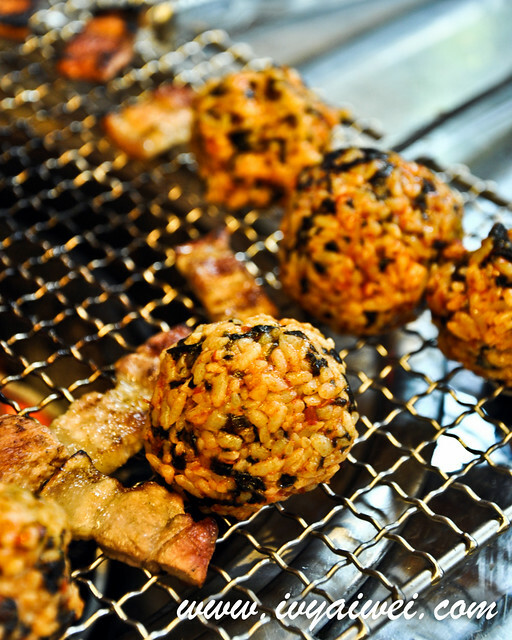 We need carbo aside from protein in one meal too, so, the Spicy Rice Ball is another interesting dish you must order. You will be given a pair of plastic gloves. 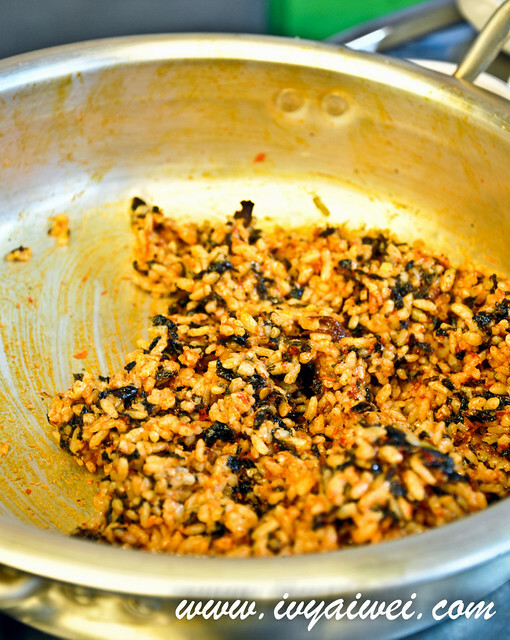 Just wear it up and mix the rice with the ingredients in the pot, shape them into balls and place over the fire. 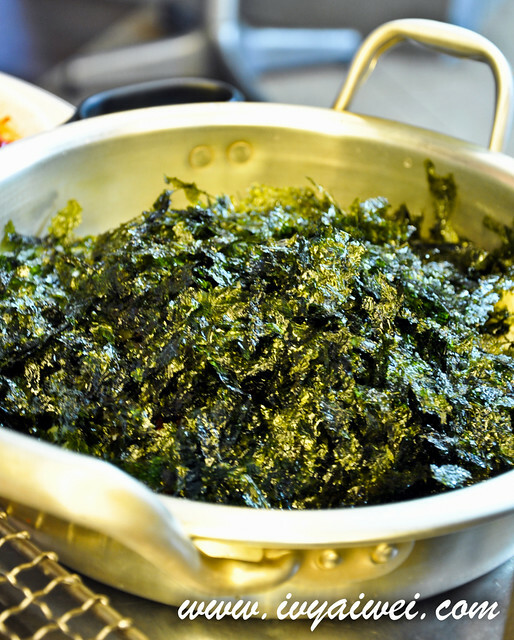 Place the rice balls over the slow fire and allow them grilling for some times; the rice balls will then have a crunchy outer crust and soft fluffy inside. Yummy!!! I love the crispy outer crust. 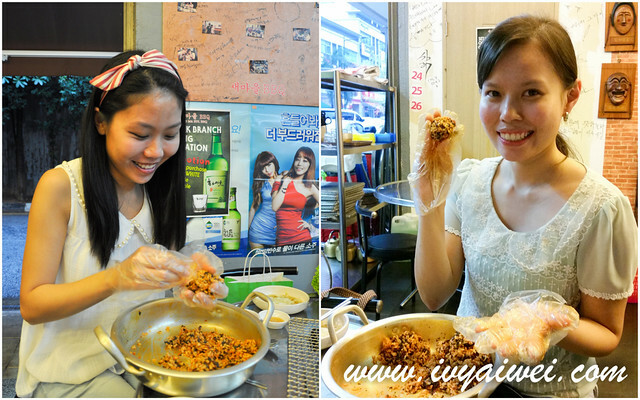 The rice balls were so fragrant and so crunchy. However, the level of spiciness is not mild. Next time I am gonna ask them to tone down the spiciness. 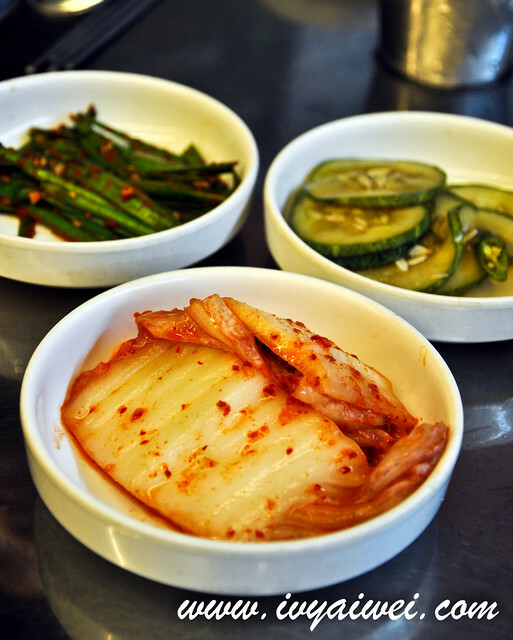 Wrap the meat up with the lettuce leaves and add sauces, kimchi, garlic or anything available, and enjoy. Choirutan Jumoekbab (Rm 20), the Spicy Rice Ball. The place will be crowded at dinner time especially on weekend. Do make your way earlier to secure your table. Ohhh yeah, if you love roasted garlic, remember to grill them over the fire too! Sigh, if I don’t have to work on the next day, definitely there will be Makkeolli or beer on our table. Ishhh. Wah, super efficient lar u!! Good food and good company, I miss you so much lar! haha, efficient coz the memory is still fresh ah. yea, great food and fresh company!!! let’s do it again when you are back!! !